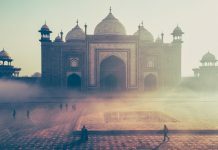 Travelling across the Indian subcontinent, we are amazed by the diversity and splendour of natural and architectural beauty found in the various tourist locations. The main tourist sites are so well known that we tend to avoid them due to the huge crowds that throng these places. 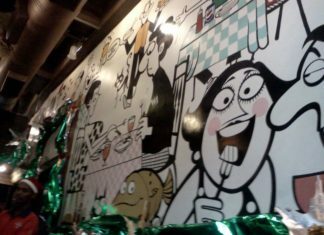 Many of us prefer the locations which are off-the-beaten-path and are frequented by few people. However, in a densely populated country like India, even the offbeat destinations tend to become overcrowded after some time! 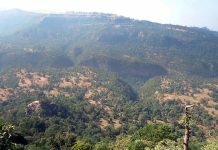 While some offbeat tourist locations get trampled by increasing number of visitors, some of these locations retain their quaint charm despite the publicity given by regular tour operators. Based on our readers’ suggestions and our panel of travel writers, we have compiled a short list of offbeat tourist destinations, which may have already become mainstream destinations! 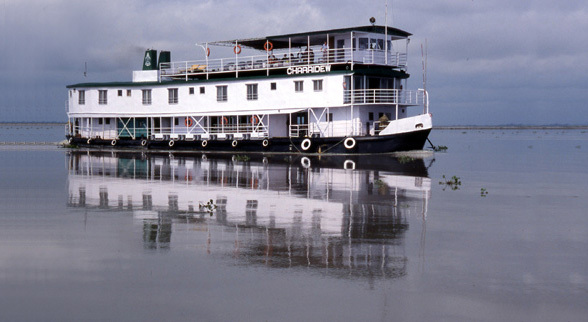 Have you heard of the Brahmaputra river cruise? 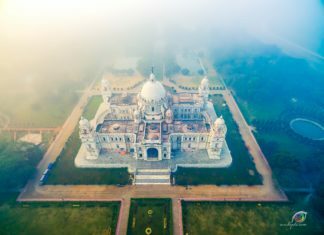 Have you heard of a river cruise anywhere else in India… Despite the existence of river boats which ferried passengers across the many mighty rivers of India, river cruise is still a novel tourist program. In the days of British Raj, large steamers used to ferry people across the Hooghly and the Ganges right from Calcutta to Allahabad. Today, river cruises on the Brahmaputra recreate this magical experience in Assam. For the next offbeat travel destination, we head up north into the Himalayas. 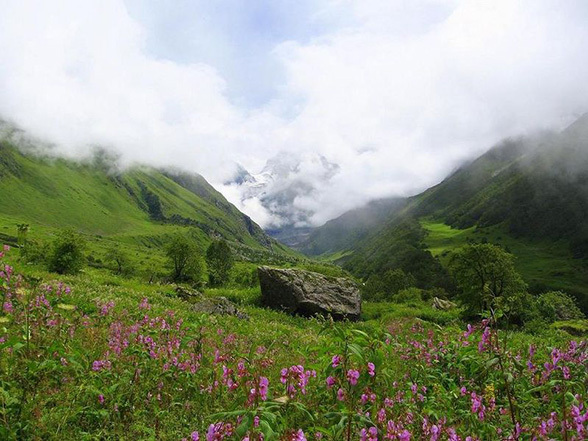 The Valley of Flowers is quite a well known destination, but it remains offbeat due to two major reasons. The difficult terrain with minimal transport and the peak season coinciding with monsoon rain. Situated near Badrinath, in the state of Uttarakhand in India, the Valley of Flowers is a vast expanse of 87.5 sq kms covered with myriad alpine flowers that bloom during the monsoon months between June to September. Nearly 500 species of wild flowers of vivid colours and spectacular designs attract botanists, nature lovers and adventure lovers from across the world. Officially named as the Bhyundar Valley, it is perched at an elevation of 3,658 metres above sea level. Obviously, this uninhabited region remains completely covered with snow during the rest of the year. So the glimpse of floral glory is available only during the four monsoon months. Since it is a protected National Park and also a UNESCO World Heritage Site, tourists are not allowed to stay in the Valley of Flowers. However, few hours glimpse of this floral glory will be enough to cherish for a life time! Continuing further north, on the foothills of the mighty Himalayas in Himachal Pradesh, at height of 2,000 metres above sea level stands the mini Switzerland of India. 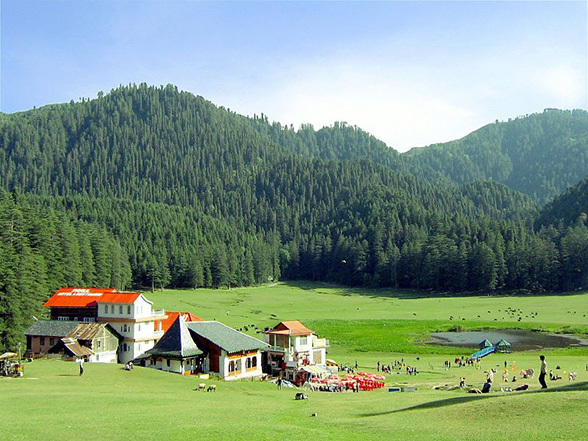 Khajjiar is a tiny hill station located at 23 kms from Dalhousie. Picturesquely set in the midst of magnificent ‘Deodar’ forests, Khajjiar has a rare combination of three ecosystems: lake, pasture and forest, all in one place. 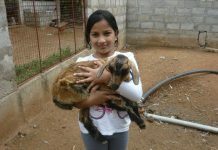 Herds of sheep, goats and other cattle graze in lush green meadows presenting a picture-perfect pastoral scenery. There is a small lake in the centre of the saucer shaped meadow which has in it a floating island. Khajjiar had minimal tourist infrastructure with just two government guest houses and single hotel. 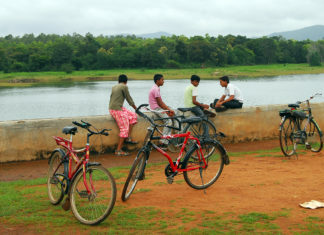 This added to its quaint charm as an offbeat destination. However, over the years some private tourist activity has entered the place. The most exciting activity is Zorbing, where tourists can roll down the sloping hills inside a large transparent plastic ball! India is known as the land of deities and astonishing miracles. So it should not be a surprise if you find a temple dedicated to rats! In Rajasthan, 30 kms south of Bikaner, lies the extraordinary Karni Mata Temple at Deshnok. Legend has it that Karni Mata (an incarnation of the Goddess Durga) asked Yama (the God of Death) to resurrect a storyteller’s son. When Yama refused, Karni Mata reincarnated all storytellers as rats! 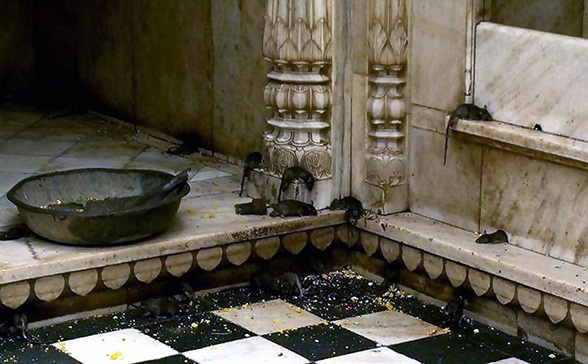 Rats are everywhere in Karni Mata Temple right from the alcoves, corners, underneath doorways, to the guard-rails. They are quite accustomed to humans touching them and offering them food. However, travellers should not make the mistake of stepping on them ever. If you kill a rat, you must offer the rat’s weight in gold as an offering to the angry goddess! Located 16 kms from the city of Jhansi, Madhya Pradesh, the ruins of Orchha epitomises the classic Indian medieval imagery. Beautiful architectural structures stand silently by the river symbolising the grandeur of a bygone era, while life in the town goes on a leisurely pace. 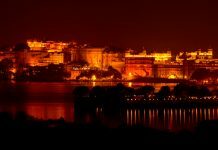 This ancient capital of Bundelkhand contains splendid 17th Century palaces and temples situated on the banks of the Betwa River. 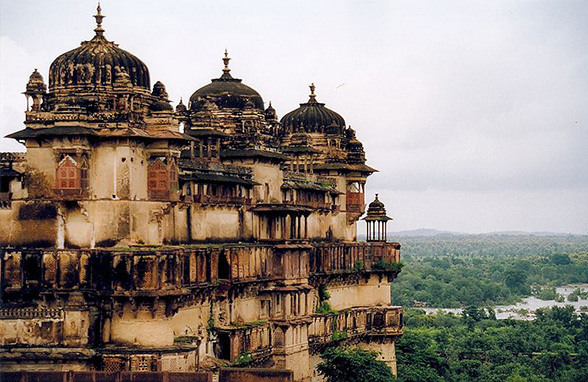 There are 14 Chatries or memorials to the rulers of Orchha built along the Kanchan Ghat on the Betwa River. Build in Indo-Saracenic style, these three storey buildings are open to all sides and have intricately designed pinnacles. Most of the cenotaphs are in a single compound with similar plans. Ram Raja Temple, Chaturbhuj Temple and Jehangir Mahal are the other attractions in Orchha. The ruins of Orchha which were lost in the pages in history are being rediscovered by new age travellers.